The top of the antenna tower. The brush at the very top is a lightning protector. Below it is the omni-directional aircraft uplink for the ACMI system. 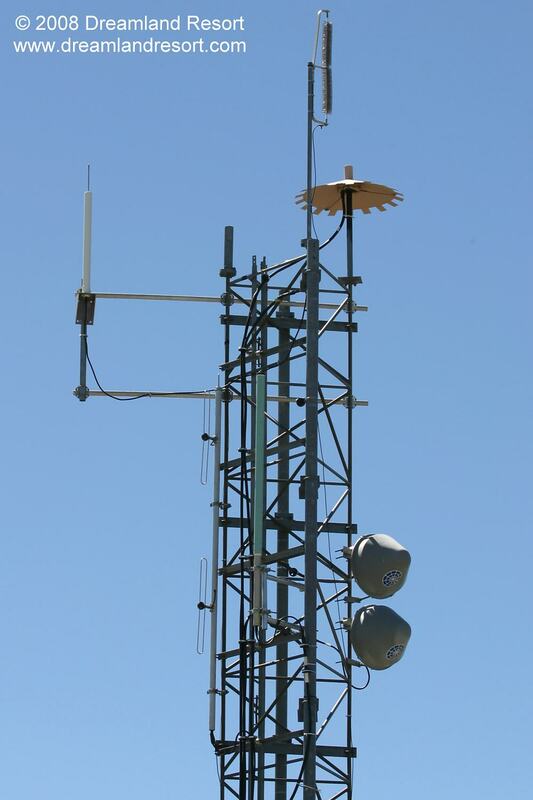 The white antenna next to it is a twin of the one mounted to the container in the previous photo. It looks like it may be for WiFi access. Below it is a folded dipole array with two 1/4 wavelength loops for the 150MHz Sheriffs repeater. The blue dipole is for the 800MHz Nevada Shared Trunking System. The two dishes are a 1.8GHz microwave link to the hub of the ACMI system on Highland Peak.